A glimpse of the country of Mongolia, its people and culture. Morning arrival at Chinggis Khan Airport in Ulaanbaatar, transfer to the hotel, after breakfast short break, city tour including Gandan Monastery and the National Museum of Mongolia. After having lunch we will visit the Choijin Lama Temple Museum in the city, dinner at the hotel. 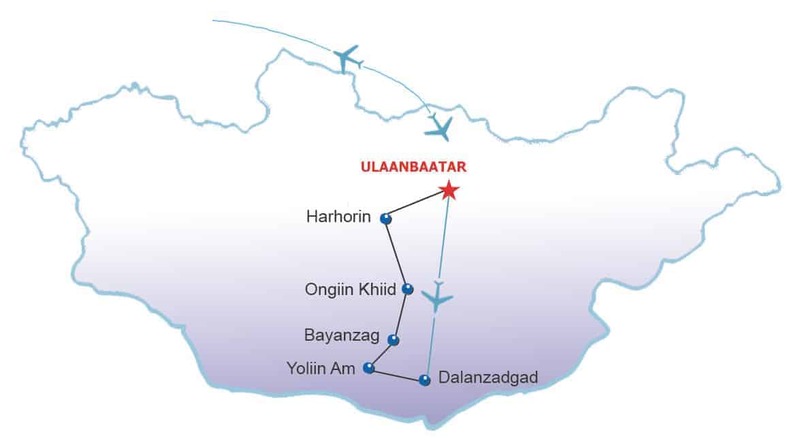 Early in the morning transfer to airport for short flight to the Gobi Desert, drive to the vulture gorge in national park Gobi Gurvan Saikhan (Three beauties of Gobi), hiking in the gorge, visiting to the Gobi-Museum, stay overnight at ger camp. Two hours drive to "Flaming Cliffs" by Bayanzag, a world famous site of dinosaur fossils. Visit a camel breeding family and camel riding is possible. Stay overnight at ger camp. Continue our tour to the north to the ruins of the temple on the river Ongi, stay overnight at the ger camp. Today we will drive to ancient capital Kharkhorin, visitation to the monastery Erdene Zuu (World Heritage Site), stay overnight at ger camp. Following the Sunway of nomads we end our trip and drive back to Ulaanbaatar, in the evening farewell dinner with folklore. Stay overnight at hotel. Early in the morning transfer to airport and departure.